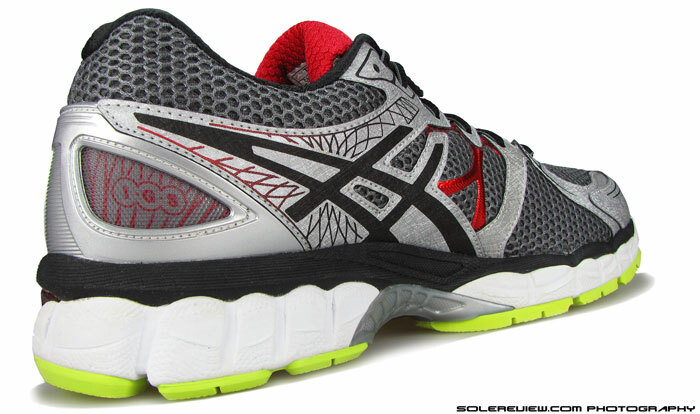 Midsole: Dual density foam, heel and forefoot Asics Gel pads. Widths available: D-standard (reviewed), 2E-wide, 4E-extra wide. Same old, same old. 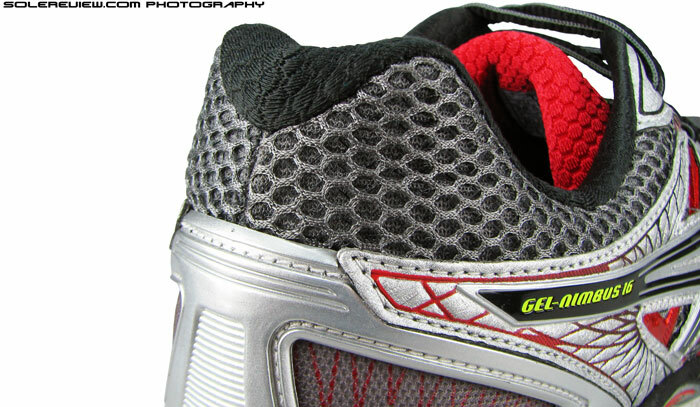 Some Gel in the heel and forefoot, with an overall padded ride. But runs firmer and un-plusher compared to last year's Nimbus 15, with an inflexible forefoot. Nothing wrong with the shoe, but the whole experience is very average. There was a time when the Japanese ruled the roost in the consumer electronics business. It was primarily led by Sony, its then charismatic business leader driving a relentless pace of innovation, hitherto unprecedented in that industry and country. Their products were so popular that many of their names became proper nouns, in the same way one would call every photocopier a Xerox. Remember Walkman, Handicam, Trinitron and Playstation? It would be fair to say that the brand significantly elevated the perception of Japanese made products, the impact of which rubbed off on many of its same country competitors like Hitachi, Sanyo, Panasonic and Toshiba, among others. This is 2014, and much water has flown under the bridge. Sony is still a large company, yes, at $75 billion dollars of last year revenue. But it is no longer the darling of the industry nor investors, its products challenged and profit margins flattened by aggressive forays from South Korean and American competitors. It doesn’t take a crystal ball to deduce that innovation is key to winning this game, something which the Japanese desperately need to weave in to their culture. Japanese designed products still remain extremely high quality, representative of that country’s culture of tending to the details. But if you wanted something fresh in consumer electronics, you will surely look at newer and cheaper alternatives. Question: What’s new? Answer: Nothing. For long, we’ve heard stories about seniority and experience trumping everything within the Japanese corporate set-up, and it still holds true today. Decision making tends to be in the hands of select seniority of age and rank, making things move slowly with little or no change. The latter isn’t only a Japanese thing; years of experience tends to instill a sense of safety-first approach, drawing on the past to cautiously shape the future. It isn’t a surprise that many recent first generation entrepreneurs were in their twenties when they started; failure is an abstract notion when one starts young. Now we don’t know how Asics works from a cultural perspective. Also never been inside their offices, but from what we’ve recently seen in their technical running line-up, everything seems to be emblematic of the culture we just referred to. Which is being resistant to change or talking risks in product development; relying solely on legacy models to drive forth their business. And while their products are good, well engineered, what’s desperately missing is a crucial element of progression. While some might argue that if it ain’t broken, don’t fix it, that philosophy just doesn’t hold water in the running shoe game anymore, at least in North America. It’s like bringing a once-cutting edge projection TV to a curved LCD screen party. It’s well put together, will work without fault for many years, but just quite doesn’t seem to fit in. When was the last time you heard to Asics bringing something new to the market? The Kinsei? That was half a decade ago, and we’ve yet to come across a runner wearing them. And we suspect that its high price wasn’t the only deterrent. The natural 33? You don’t want us to start on that one. Increase in firmness makes the Nimbus forefoot very resistant to flexing. That said, it would have still been okay for the Nimbus 16 to keep doing what it has been for the past many years. That is, striving to be the go-to shoe in the premium neutral cushioning category. However, the tweaks made this year run contradictory to that intent. How else would you explain that flexing the forefoot of Nimbus 16 makes you consider including weight training into your routine? Or it doesn’t feel as half as plush and cushioned as the 2013 Nimbus 15? Or the fact that its heel set-up behaves very oddly, and certainly straying way from the shoe’s ‘neutral cushioning’ positioning. The shoe looks beautiful from an aesthetic standpoint, with use of premium looking materials and exemplary cosmetic detailing. All that is good when you’re not going anywhere, but put some miles on it, and the overall experience can be best termed as unremarkable. It will serve you well if you’re looking for a shoe with reasonably padded feel, but to coax anything more out of the Nimbus would be a daunting task. 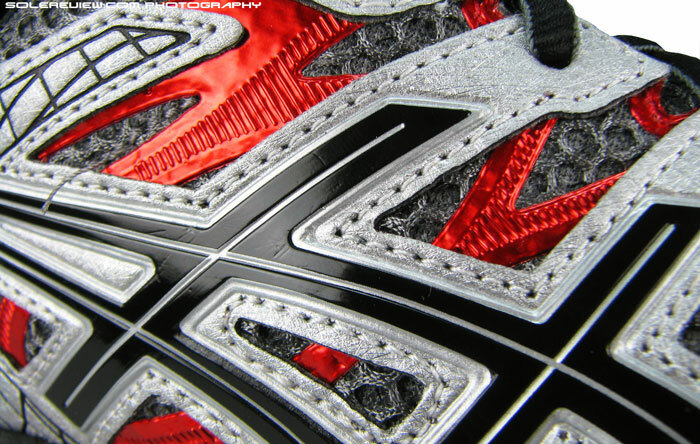 Now, coming to the strangeness in heel midsole set-up we were talking just a moment ago. The definition of a ‘neutral’ shoe, according to us, is one which does not use any component(s) designed with the goal of gait correction. 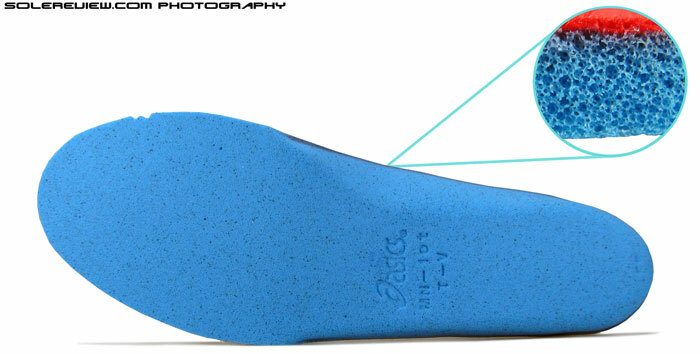 In plain words, the softness of midsole foam on both sides of the shoe should be the same, allowing the foot to roll naturally. That is why the design of the Nimbus 16 so puzzles us. 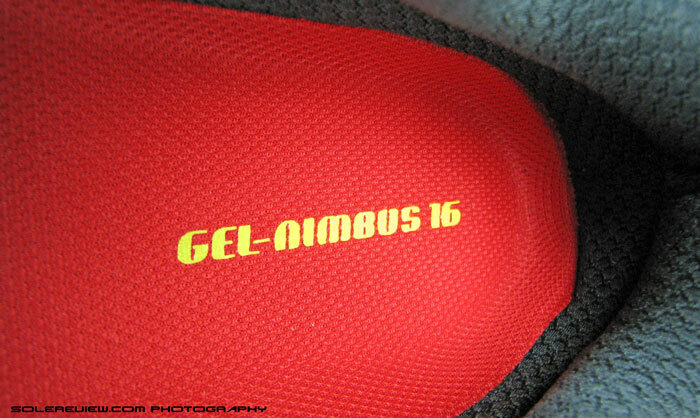 The Nimbus 15 was no issue, its heel Gel pads balanced in softness by cushioned foam on the opposing side. Not so on the Nimbus 16. There are a couple of changes which tilts the till-now familiar ride behavior in a different direction, literally speaking. The Nimbus 15 (on right) had a neutral-biased heel set-up, while the Nimbus 16’s (on left) heel has an uncanny resemblance to Kayano 19. With the Gel side softer than inner midsole, the Nimbus 16 actually performs like a motion control shoe, its heel tilting laterally during footstrikes. The Gel Nimbus 16’s midsole foam on the inner side is much firmer than the outer Gel pads, and if this reminds you of something, then your hunch is spot-on. Every rear foot strike produces a result which feels eerily similar to the Kayano 19. The softer Gel inserts compress more than the foam(medial) side when you land on the heel, tilting the Nimbus 16 slightly outwards. And that’s not the only thing which causes that. The Gel and medial foam are stacked at an angle along the centerline, bringing images of pronation-control shoes forth to mind. The picture above clearly shows the contrast between Nimbus 16 and 15, while highlighting design closeness with the 2012 Kayano 19. 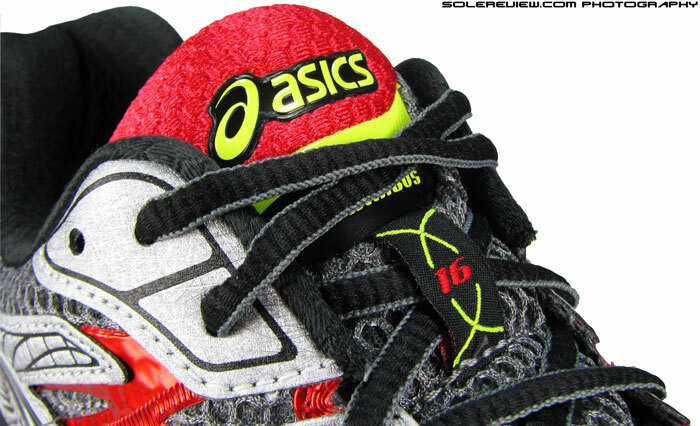 The foam is firmer overall, but the design also drops the compression grooves seen in the plusher and softer Nimbus 15. In the Nimbus 15, the foot strike was unmistakably neutral because of its more gradual layering, combined with softer density foam. 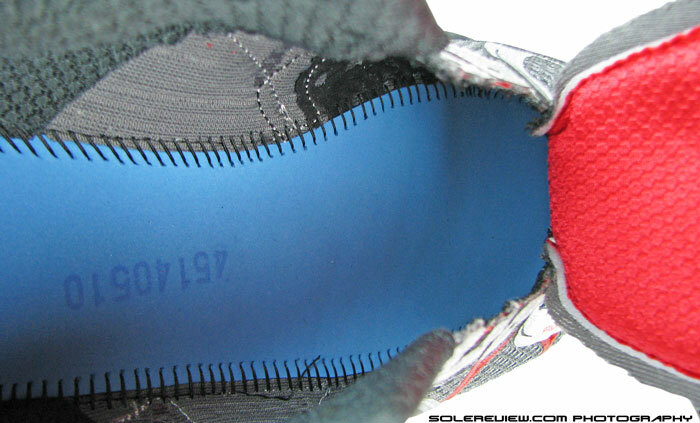 The non-Gel midsole side also had these horizontal grooves built into the wall, helping easier compression – something which ended upping the cushioning levels. The 2014 Gel Nimbus 16 has a much firmer ride, made possible by the changes we’ve run you through earlier and the lack of grooves on its sidewall. In a way, it goes back to how the 2012 Gel Nimbus 14 felt with its relatively firm feel, except for the 16’s mysterious Kayano-fication. 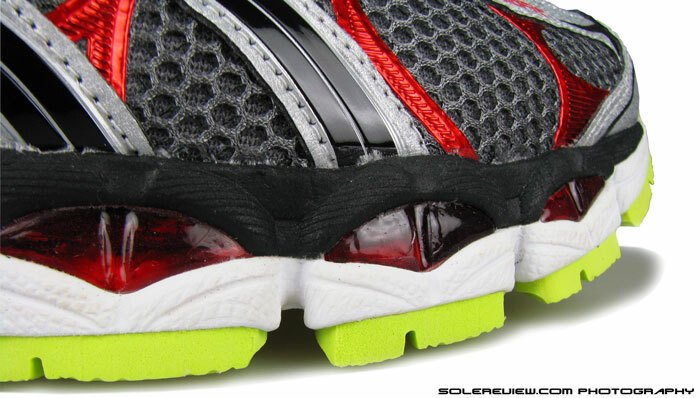 The forefoot Gel windows are less wider than that of Nimbus 15. The reduced weight hints at decreased Gel volume. Though there’s a huge Gel pad in the rear, overall landings come firmer. Foam strobel below the footbed is carried over. Forefoot in the N-16 is very stiff, and is firmer too. It doesn’t bend very well, and that translates into a feeling that your foot is working harder during runs. Within the Asics world, its stiffness is equaled by the Kayano 20, while models like the Nimbus 15, Kayano 19 and Cumulus 16 fare better. And about the firmness, it appears that reduction of Gel volume is the reason. Can’t say for sure unless we dissect the shoe, but the massive weight reduction holds a strong clue. The Nimbus 15 was 380 grams, and this year’s model see a straight drop of 30 grams, going down to 353 grams for the near-same size. 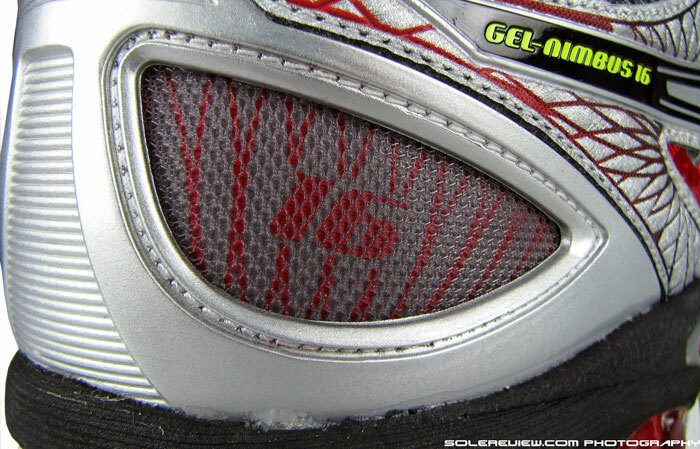 Now all things being equal – the upper and midsole foam doesn’t swing the needle much, which leaves only one variable: the Silicon based Gel pads. 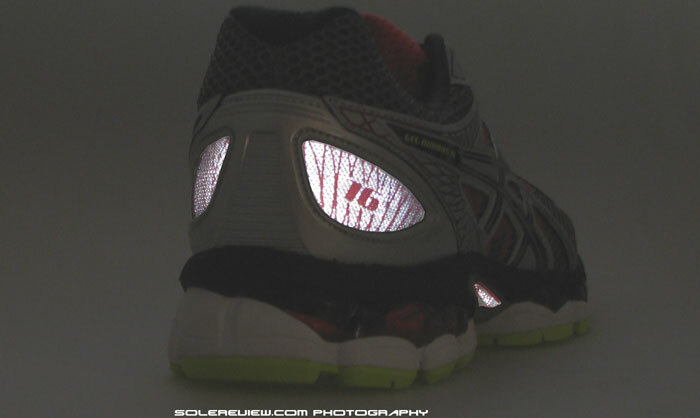 The forefoot windows are also smaller than the 15, a possible indication of corresponding (and reduced) usage inside. The sockliner is made of generously puffed up foam. 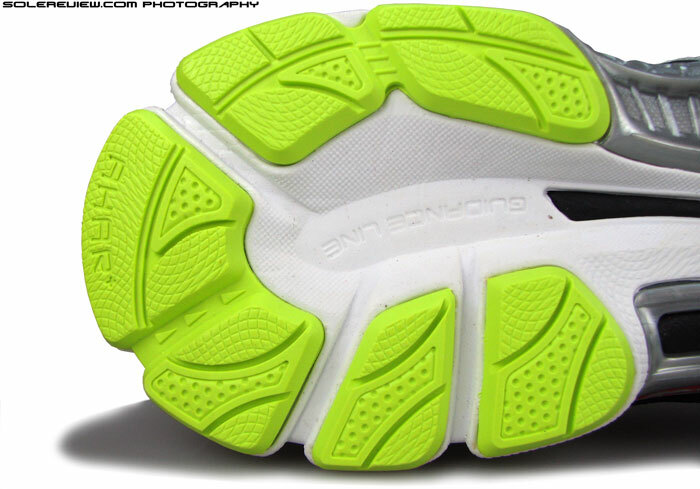 Outsole layout is unchanged, more or less. Rubber in front and rear, separated by a plastic shank. Forefoot has blown rubber. Despite the flex grooves, forefoot is inflexible. Round all these updates up, and what do you get? Nimbus 16 runs cushioned, but in a firmer fashion relative to the Nimbus 15. The footbed is a carry over, with a generously air-blown cellular structure (see picture above), and scores well on delivering just-under-the-foot cushioning. 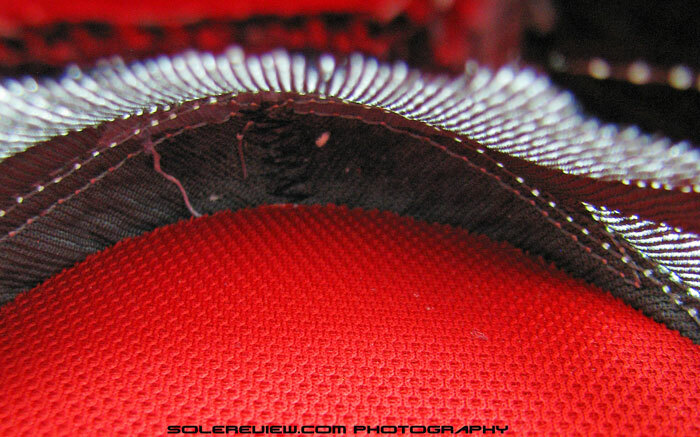 Since the midsole densities are firmer with possible trimming down of Gel units, the shoe has been un-softened overall compared to previous year plushness. Rest of the ingredients are part of the tried and tested Nimbus formula, like the blown rubber forefoot and carbon rubber rear-foot, groove separated heel crash pad and the plastic shank. Grip is ok, and so is durability. Transition feels no different than many other Asics models, as the ‘guidance line’ makes its appearance here too. 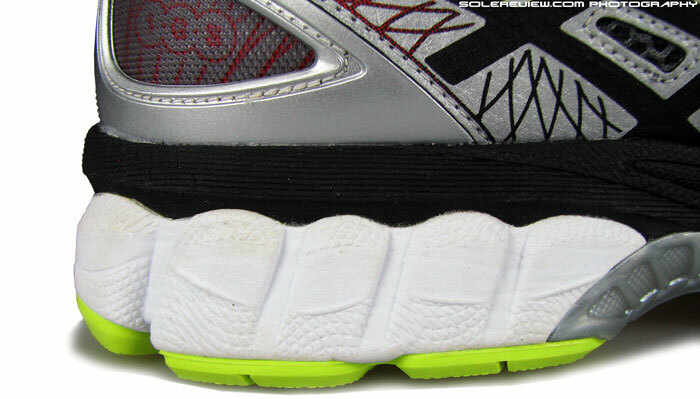 Which happens to be this grooved depression running midfoot to toe, designed to keep weight loaded along the center. 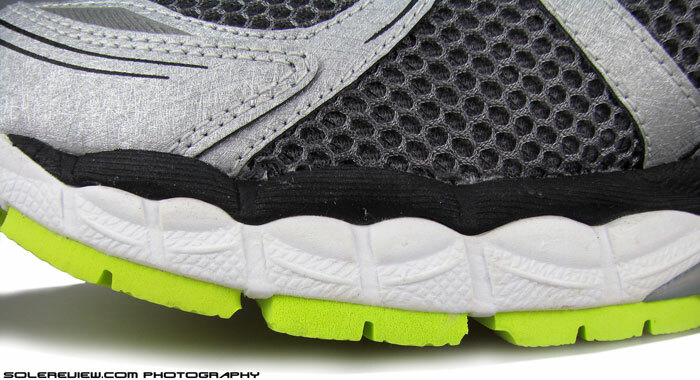 A familiar Asics sight; layers of textured synthetic, welds and support panels. Collar is snug, but it loses the silky smoothness of Nimbus 15 due to mesh change. Upper features all the standard Nimbus fitments, utilizing a palette of welds, synthetic overlays and spacer meshes. The synthetic leather used looks more detailed than the Nimbus 15, featuring a faux fibreglass kind of texture – with no difference in function. However, if you’re transitioning from the Nimbus 15, you’ll immediately sense that the level of plush has taken a knock. 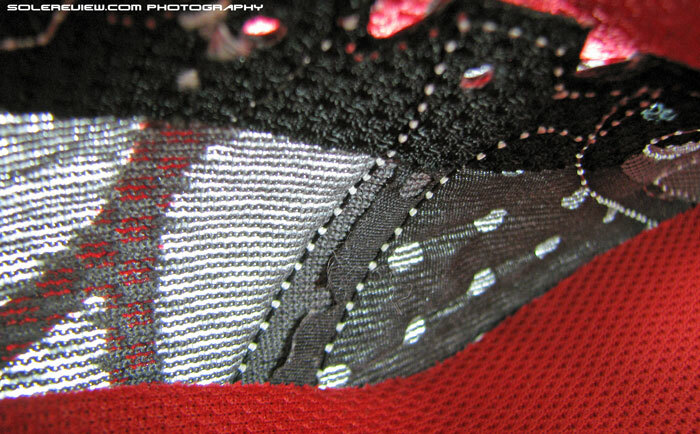 While it feels premium, the collar and tongue meshes aren’t as smooth as the type used last year. This change is evident the moment you slip your foot inside the new Nimbus. Collar is securely snug, but misses the soft cocooning sensation of the 15. Ditto for the tongue. And what’s with the new laces on the 16? The one used here feel hard and raspy, in a stark contrast to the materials surrounding it. 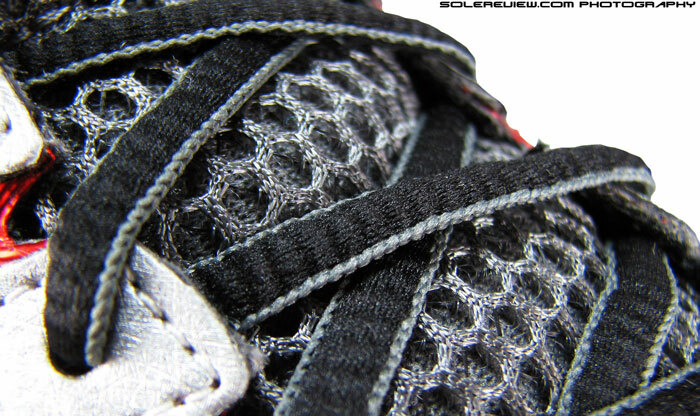 Same laces are used on the $100 GT 1000 2, but hey, that shoe’s $50 cheaper for a reason. The new air mesh used on Nimbus 16. Not as spongy as Nimbus 15’s, but more breathable. Picture from inside of the Nimbus 16. Lots of pores to let the air and light in. Lateral side of the upper interior. And the well ventilated forefoot/toe bumper. Nimbus 16 has a snug fit all the way from the collar to forefoot, while running true to size in length. 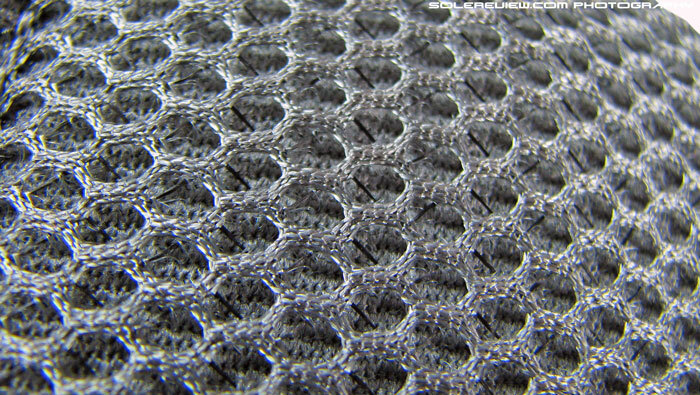 The new mesh is flatter and less spongy than the one in the 15, so it adds to the reduced feeling of overall plushness. If anything good comes out of the change, it’s the ventilation. 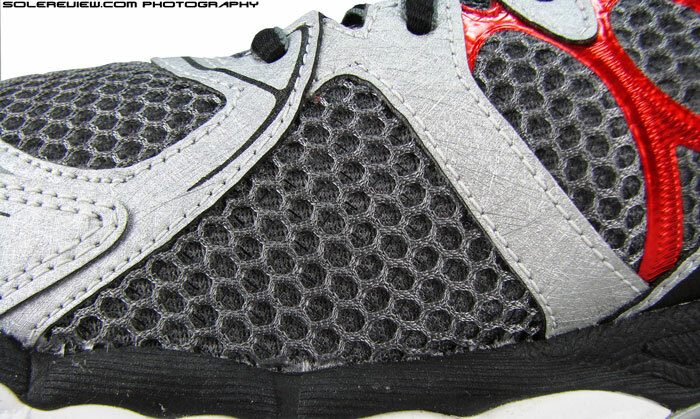 Open spacer mesh sits closer to the foot surface, which allows better air circulation. We took a few inside shots which show that while there are lot of overlays, there’s plenty of open-ness weaved into the mesh structure. Tongue isn’t attached in true Asics tradition, but doesn’t slide around. 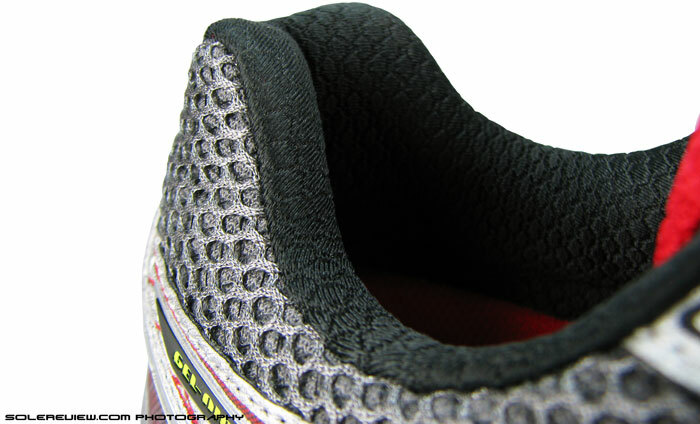 Forefoot sides on the Nimbus 15 had this soft plumpness of a mesh, which also felt more roomy. This section is replaced by a regular mesh in the 16, the consequence of which is a snugger feeling. Tongue is a separate component without a sleeve, as the precedence has been in current and past Asics models. 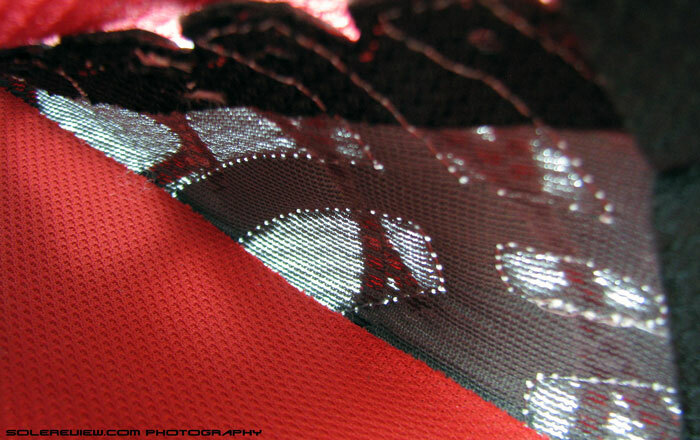 However, due to the choice of material and pattern design, tongue slide isn’t an issue. Midfoot fit is snug, and traditional lacing maintains adequate levels of lock-down. Reflectivity is improved this year. The teardrop shaped heel underlays do a great job of staying shiny at night. And there’s this reflective bit on the shank. Night time visibility has been improved here. Teardrop shaped heel panel grow larger in size, artistically overlaid with the ’16’ and ‘IGS’ (Impact guidance system) on either sides. 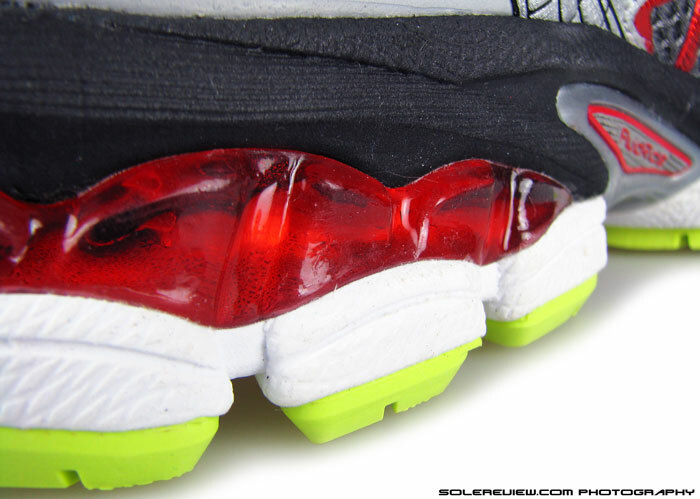 In addition, there’s the carryover bit on the outer midsole and on the toe tip. The Nimbus 16 lacks any shape or manner of newness, a slightly crooked repetition of its Gel+weld+EVA+spacer mesh formula. Crooked because it behaves more like a version of Kayano than any of its previous Nimbus editions, and repetitive because we’re hard pressed to point out anything fresh. In the world of lightweight running neutrality, the Nimbus is inching towards product obsolence. At $150, it is an expensive shoe, yet doesn’t excel in even one area. It isn’t the lightest, because at 353 grams, it is heavier than most running shoes. It isn’t the most comfortable nor plush in materials and fit; there are shoes which will top Nimbus in that regard. 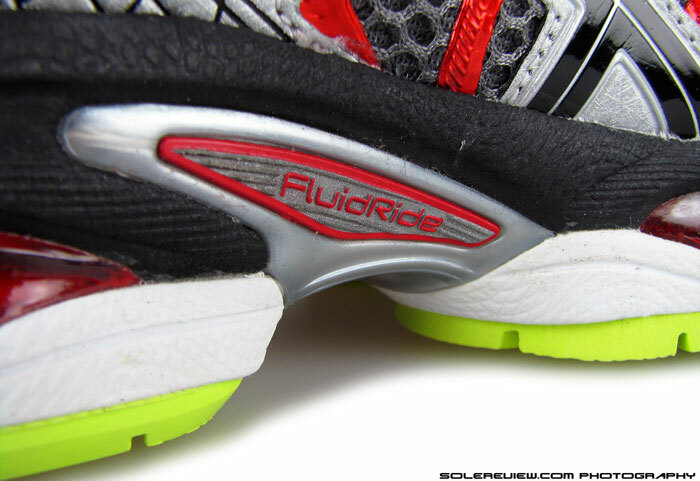 And as far as running footwear innovation is concerned, Asics is pretty much dead in the water, relying on 2006 footwear construction techniques to make a 2014 model. We beg of you – do something radical, Asics. Dump the status quo and completely redesign the Nimbus over the course of next two years. Don’t worry about how runners will miss the old Nimbus; there are still plenty of models in your line to fill its Gel padded hooves. Note on ratings: Our numeric scoring of 8/10 is based on a total of weighted averages. The attributes namely transition, stability and fit contribute to 69% of total scoring weight, which we see as more important than material (7%), cushioning (7%), traction (12%) and weight (5%). Hence the scores will not add up when simple average calculation is used. Guys, sorry for the redundancy but I hope you won’t mind compliment over your great works – you guys have done fantastically over all these reviews. It is review that I personally feel consumer / runner like us would want to see. Your dedication to the review can be read in your writing. Keep up the good work! Back to Nimbus 16, seems like a let down as I was expecting similar plushness if not better than Nimbus 15. Yup, the Nimbus 16 is an exercise in reduced plushness, compared to the Nimbus 15. I have Nimbus 16 for my long runs and I like them. What shoe do you think would be better for the fast runs and for a marathon race Adios Boost 2 or Kinvara 5? Can you suggest any other to check? Kinvara 5 seems the safe bet here. The Boost Adios and Boston are good shoes, but check the fit before buying – upper is tight, and the area under arch is hard too. We like it, but might not suit your preference, given that you’re using a Nimbus 16. How about the Nike Air Pegasus 31? Or it might just be better to buy a few colors of the outgoing Nimbus 15 if that is working trouble free for you! Big fan! Thanks for all the reviews. You help so many people. I am just recovering from my ACL surgery a few months back. I am looking to run around 30 miles a week. As a 194cm 80kg, would you suggest this shoe or Lunar glide 6? Or something else? Sorry to hear about your ACL, hope you are on way to a full recovery. We want you safe, so before starting to put 30 miles a week, just make sure you’ve got a green signal from your PT. Running is a linear movement, so while it is not particularly stressful for the ACL, things like running on motorized treadmills and graded roads (downhill or uphill) can be potentially damaging. So assuming that you’re running on a flat, firm surface, a shoe which has stability (and by which we mean not the motion control type) could help. 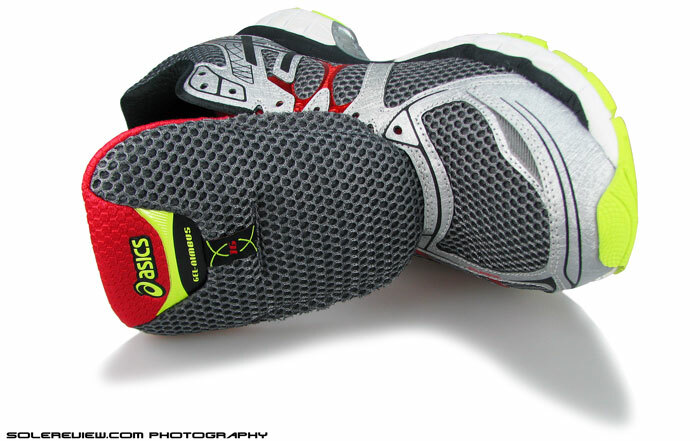 Something like the Brooks Adrenaline GTS 14 comes to our mind, which balances padding and support in good measure. That said, all our advice is of a general nature and not intended to be a substitute for professional medical opinion. Hi, thanks for the review coz I used to think Nimbus models are the best cushioning line of Asics. Would you mind suggest several suitable shoes for jogging please? I’m 182cm, 109kg, right foot arch is normal, however my left foot arch is a bit flat and I’m suffering from plantar fasciitis on left foot for several years. What shoes have worked for you in the past, which did not cause any discomfort to your PF? I used to wear Nike Lunarglide 4 and own Lunarglide 6. Their forefoot and heel cushioning are great, but lack of arch support for my overweight body after long period wearing and standing. I just purchased Brooks Transcend today, the mid sole are firmer than Lunarglides with sufficient cushioning and rebound. Now considering Adidas Energy Boost 2, Asics Kayano 20 and Nimbus 15, what do you think and suggest? Good call on the Transcend, that is one good shoe. Great cushioning which gets felt more during runs than at walking speeds. Out of the alternatives you’ve listed here, we’d choose the Nimbus 15. Thanks, i’m gonna try it. Besides those I listed, any other recommendation please? Adistar Boost is worth a shot too. I also tried Brooks Glycerin 12 together with Transcend, I believe Glycerin 12 is soft cushioning shoes with better transition coz the midsole foam are less density soft and thinner. Without enough arch support is properly another reason of better transition. Hi, between the Nimbus 16 and Glycerin 12 which one is softest in the heel? It will be the Nimbus 16. 6’6; mild overpronator; currently running in the mizuno wave paradox. Never thought I could safely run in a nimbus with my overpronation but these sound like they could do the trick with the added firmness. Could these work for me? I love my Paradox’s but they are a little too controlling. Would like a little more cushioning and with my large frame and foot size (16) these may work. Thoughts? Haven’t worn the Paradox, but if the Wave Rider 18 and Sayonara 2 is anything to go by, the Nimbus 16 will feel way softer in comparison to the Wave based cushioning. Also assume you’re a heavier (6’6″) runner, so that will result in a higher level of compression on the Nimbus. Will they work? Can’t say for sure, but given how the new Nimbus behaves, might be worth a shot. The Nimbus 15 was in a different cushioning class altogether. Nice move stocking up on the 15’s! 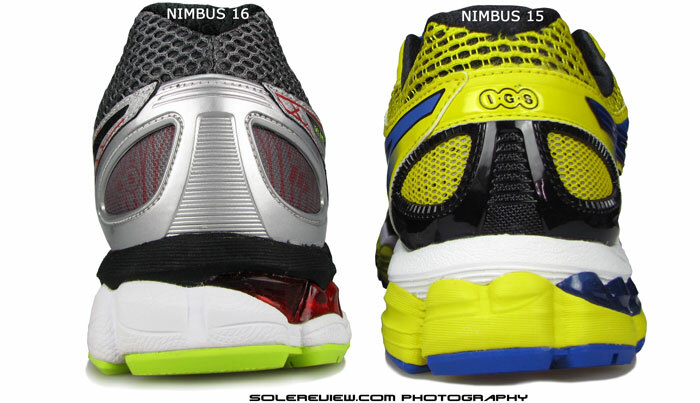 The Nimbus 17 looks really radical, so that could turn out to be a completely different shoe altogether. Good or bad? Can’t say till we do a review next year! Hi Solereview. Why do you think Asics continues to use technology which is over a decade old? While Nike and Adidas continue to innovate, Asics uses mesh and stitching which make it look like an old person’s shoe. Most of the young runners on the road these days are using Nike and Adidas. Is it because the old technology has been proven to last longer and be more durable than the sock-like/knitted fabrics of Nike and Adidas? Or is Asics too scared to take a gamble on new technology? The Kinsei 5 has a new, modern upper but thousands have complained of the material ripping after a couple months. I really want to buy myself a pair of Asics but is the tradeoff worth it? We just think that Asics is resistant to change. However, specific to the Nimbus, the next version (17) has a completely new upper, with welds and all that. However, whether that is good or bad will be seen once we review them in summer 2015. I have been using the Nimbus 14 since 2012 and those shoes are the perfect fit for my long runs. Usually I can still get them around 100 dollars. But now it costs almost twice as much. I am planning to change my preference to the Nimbus 16. Would it be a shock to my feet as they are used to being pampered by the 14 ones? Actually the Nimbus 16 feels closer to Nimbus 14 than 15, so don’t think it is going to ‘shock’ your feet, as you say. Hello, just wanted to know whether it would be worth while waiting for the Nimbus 17s which are supposedly coming out in March, or I should purchase a pair of the 16s now? The 17’s go a brand new direction, so worth the wait! I need a shoe ASAP (and I need it in India, so can’t see 17 coming for a long time). I am running on Nike Pegasus 29 which needs to be discarded ASAP. Honestly it wasn’t the best I could get, so wanted to try Asics for the first time – mostly because “extremely excellent cushioning” is very important for me as I am a road runner and uneven surface to it. I have high arches and I run on the road (no park or trail near my place). So should I rather go for Nimbus 15, or Cumulus 15, or Cumulus 16 rather than wait for Nimbus 17? Because after reading your review I anyway believe Nimbus 15 is better than Nimbus 16. Hi – sorry for the delayed response. Looking at your option list, the Nimbus 15 would seem like it. If there’s any drawback, it’s that the shoe is a bit heavy. Ordered Nimbus 15, even though Nimbus 16 and Cumulus 16/15 were available at lower prices. I run on road so cushioning was important. Hope things work out well. The Nimbus name notwithstanding, the versions are quite different. Based on what you wanted, the N-15 should do just fine. I’ve done about 200 to 250 kms in the Nimbus 16, previously had the Nimbus 14. I loved the 14’s and didn’t hesitate to buy the 16s when the time came after about 1100 km on the 14’s. The Nimbus 16 is a totally different shoe compared to the 14 due to added gel pads as referred to in many reviews. Another difference if the fluid fit uppers in the 16’s. After about 100 kms in the shoes I started to develop many problems from my feet and heels, through my knees and eventually left hip. 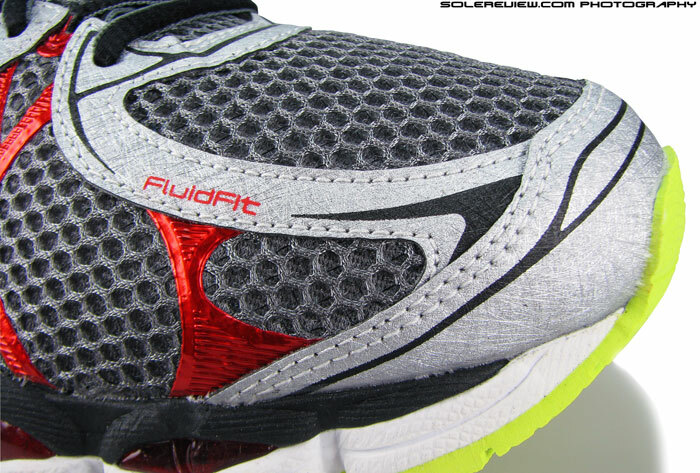 I am not sure whether this is due to the added cushioning, or the “fluid fit” upper. The fluid fit upper chafed the upper ends of my big toes so much that I unconsciously started altering my gait to reduce the irrigation and pain. Eventually things became so bad that I just couldn’t face going out the door and do a run. My feet and heels feel like they are tearing apart. Yesterday I went out and bought a pair of Cumulus 16’s – which is supposed to be less padded and the uppers also are not “fluid fit”. I’ve only done 5k in the Cumulus, but my feet already felt much more relaxed after the run. When I put the Cumulus 16 next to my old Nimbus 14’s it seems like the placing of the gel pads etc are just about exactly the same. Yes, the uppers look less “premium” but who cares about that if your feet doesn’t feel like all the sinews are torn off after a run? These days successive versions of running shoes change so much, it has unfortunately become sort of a lottery. The same model name means little, and there is no guarantee you’ll like the latest model. Hi! I’ve been a recent lurker/ardent fan of your website since I started researching for the best cushioning, most plush shoes for a mild underpronator such as myself. Have you tried Asics Sendai? If so, can you review it? Thanks so much! Thanks for the comment! We haven’t tested the Sendai, but unfortunately have no plans to do for now. Not very popular and not sold well globally, so lesser ROI for our money and review effort. Sorry about that! Sorry to hear that. Is there a way to return them and get something else? Nop it’s not possible.i already have a pair of ultra boost and i’ll continue training with them.i ll try to sell the nimbus! !thanks for the imediate response.continue the good work and your eccelent reviews!!!!! I’ve read through most of the post on here and I see a lot of mixed opinions. On one particular post I see that the Nimbus 16 is in comparison to the Brooks Ghost 7 because of the firm cushioning. More than likely this would suite me because I need a firm well cushioned shoe being I’m 230lbs. I’m not a fast runner to say the least 8/9 minutes per mile tops. I supinate when I run and have low arches. Can you let know if these would be ideal for me. Both shoes are a good match, except that the Nimbus 16 is slightly more cushioned than the Ghost 7. Also consider the adidas Supernova Glide 7 (or 6, if possible) Boost and the Under Armour Speedform Gemini. You are fantastic! I have Nimbus 16 for a year, hearing everywere it s the No1 running shoe. What a lie!!! They are too hard and heavy and after only 2km I feel serious discomfort. You even mentioned about these awful laces!!! I ll donate them to a friend and buy something new: What do you propose? —> 6ft, 185lb, natural arch, I hit the ground first with my forefoot, run mostly at the track, at 7 mph for 4km (10 rounds – 2’10” each), 3 times per week, have some issues with my knee occasionally. I was thinking of pegasus 30. Or what else? Pegasus 30 is ok, try the Vomero 10 and the New Balance Fresh Foam 1080 V6 too. Thanks! I decided that a lightweight but adequate cusioned shoe is my category. I think of Ride 7, NB1500, 890v3/v4, Fresh Foam 980, Adizero f50 2 (or maybe the Cohesion 8?). And I d like it no to wear quickly. What would you prpopose? How about the adidas Supernova Glide 8 Boost or UnderArmour Speedform Gemini? Gemini was too hard, Glide was just ok. I decided to buy the flyknit lunar 3. But I have nowhere to try them. 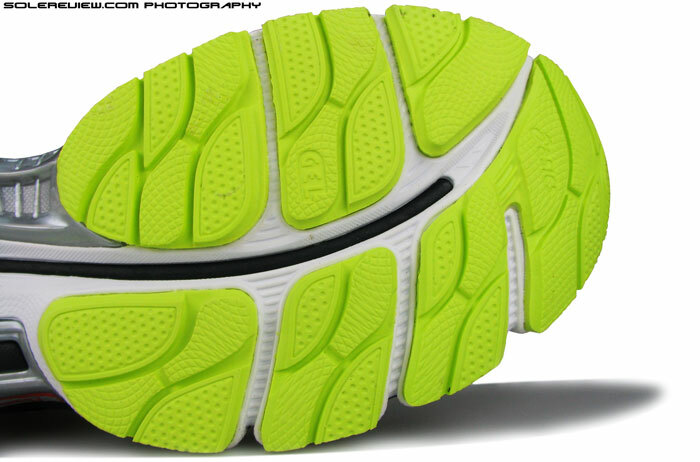 The Pegasus 32 are a little narrow at 11 size in the forefoot. What size you suggest me for the lunar? Depends on your foot shape, but generally speaking you should be ok with the same size. The FLK 3 will have more room above the toes, that’s all.